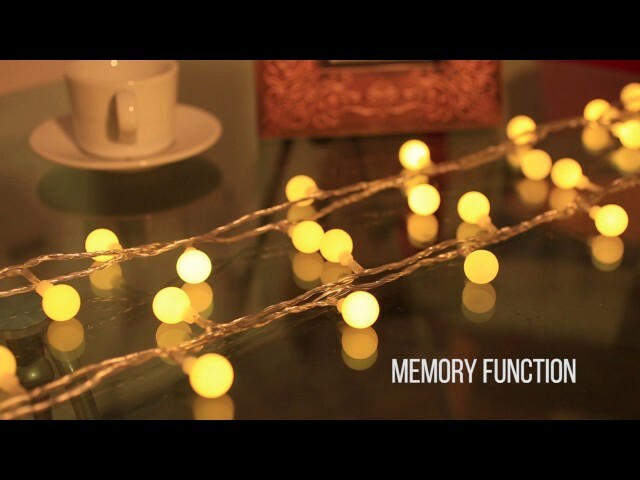 This ball string light is 10m long enough for your decoration, and with 100 energy saving LEDs, it offers fancy and romantic warm white color lighting performance. The waterproof rating of this light is IP44, which means it can resist water splashing. 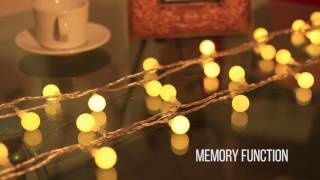 So the globe string lights suitable for use on the balcony, corridor, summer house, etc. You can use it for ambience decoration and atmosphere creating, like decorating your garden, yard, summer house, corridor, holiday, festival, Christmas tree, Thanksgiving, etc. "Having already purchased one set of these lights for my patio, my two teenage daughters liked them so much they wanted a set each for their bedrooms. Delivered promptly and well packaged. Pleased with the lights and would recommend so five stars." "Very satisfied！ Beautiful in my room"
"These globe lights create a lovely effect indoors ( they are waterproof and can be used outdoors with IP44),I draped mine around a mirror and think they look lovely.these are very pretty lights that can be used safely around the house and have a facility to put them on flash if you wish. Really good value." "We bought these to put in a large ten for my teenagers birthday party, they worked well and were left on all night to give a nice light whilst they stayed overnight in the tent." "Had the desired effect , thanks."